At Fima tradition and innovation live together under the same roof and happily so. The company is deservedly popular for the superior quality of its Raffaellesco, Ricco Deruta and Arabesco pottery, to mention but the most popular traditional Deruta designs. They are among the best we found in town for their rich details, fine touch and fidelity to traditional colours and techniques. The work on innovation, the other soul of the company, is performed with equal commitment. New designs and tableware shapes are regularly added to Fima’s catalog, confirming the company’s vital creativity. 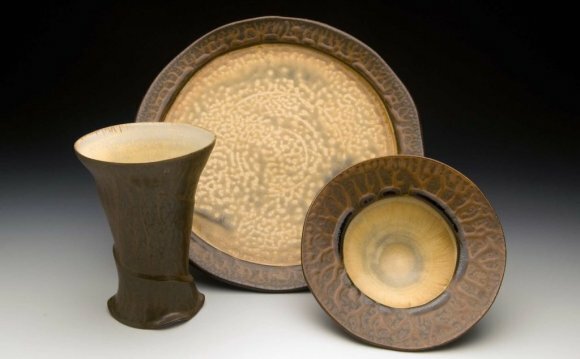 Product availability : if not in stock, Fima’s pottery is available in 6/8 weeks. Fima is a small, family run company. Pietro founded it more than 40 years ago, together with his wife. He was an excellent painter, very concentrated on quality. His respect for the most traditional techniques combined with his creative approach to majolica won Fima his fame both for their traditional designs, such as Raffaellesco, Ricco Deruta and Arabesco, and for their modern patterns. Today Michele, his son in law, and his daughters run the family business, building on its key strengths: quality, tradition and creativity. They can count on the experience of a group of affectionate and qualified artisans, some of them working in Fima from its very beginning. The production cycle is completely carried-out within the company, from the shaping of clay to the kiln firing. We’ve chosen Fima for the most classic patterns of Deruta pottery after a long selection. As you can imagine, everyone in Deruta can paint the Raffaellesco design. But only a handful of artisans do that with the rigour and the fine touch we found at Fima.